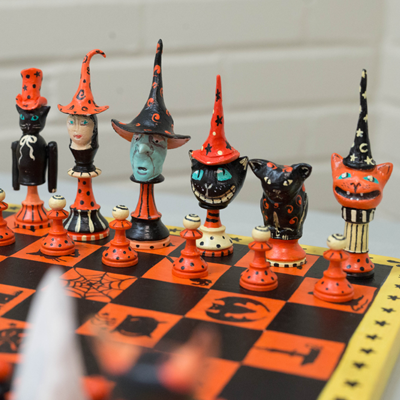 ﻿Through the Featured Chess Set project, the World Chess Hall of Fame showcases a variety of chess sets throughout the year. These include highlights from the institution’s collection as well as chess sets owned by Saint Louis metropolitan area friends and chess lovers who have special stories to accompany their sets. Do you live in the Saint Louis metropolitan area and have a chess set with a great story? 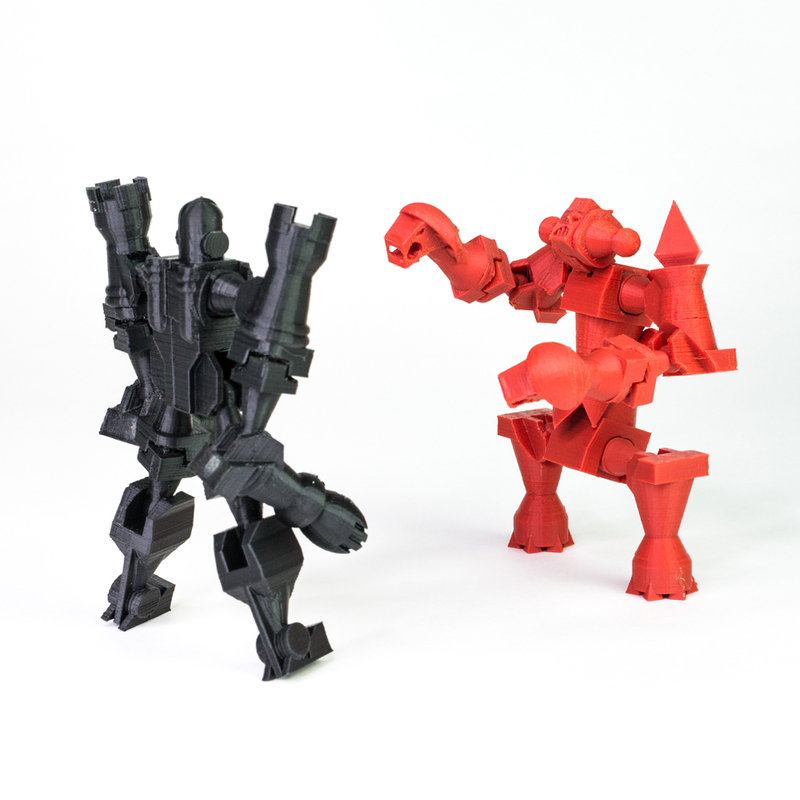 Submit it for inclusion in our Featured Chess Set project! This program highlights chess sets with interesting backgrounds borrowed from chess lovers and fans of the Hall of Fame. Featured chess sets are displayed for a period of one month at the World Chess Hall of Fame. If you would like to participate in the program, send a photo and the story of the set to Emily Allred, Assistant Curator, at emily.allred@worldchesshof.org. January's Featured Chess Set is on loan from Kyle Weber, a scholastic coordinator at the Saint Louis Chess Club. Weber, who has nearly a decade of experience in public education, public policy, curriculum, and instruction, has worked with the organization since September 2016. While he was teaching at University Academy in Kansas City, chess became a regular part of the school day both inside the mathematics classroom and as part of a robust 80 student after school chess program. Chess facilitated a need to connect with students on a personal level and address the holistic needs of their development. Weber is a father, husband, and educator. King size: 2 1⁄8 in. Board: 17 3⁄4 x 17 3⁄4 in. February’s Featured Chess Set is part of the collection of the World Chess Hall of Fame (WCHOF). Since its creation in 1986, the WCHOF has endeavored to highlight the history and cultural significance of the game of chess. 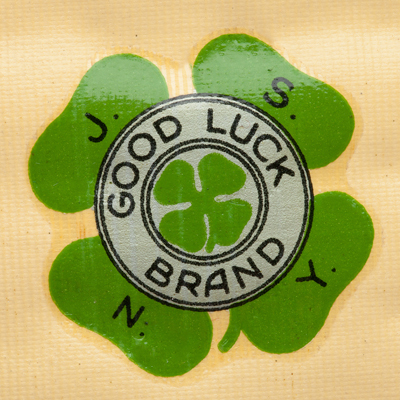 The WCHOF’s collection is diverse and includes sets once owned by legendary players, mass-produced sets with lively pop culture themes, antique ivory sets, travel sets, as well as chess computers. Through these artifacts, the WCHOF illustrates how chess has evolved through its over 1500-year history. This set is part of a generous donation from the estate of Jacqueline Piatigorsky, a 2014 inductee to the U.S. Chess Hall of Fame. King size: 2 11⁄16 in. 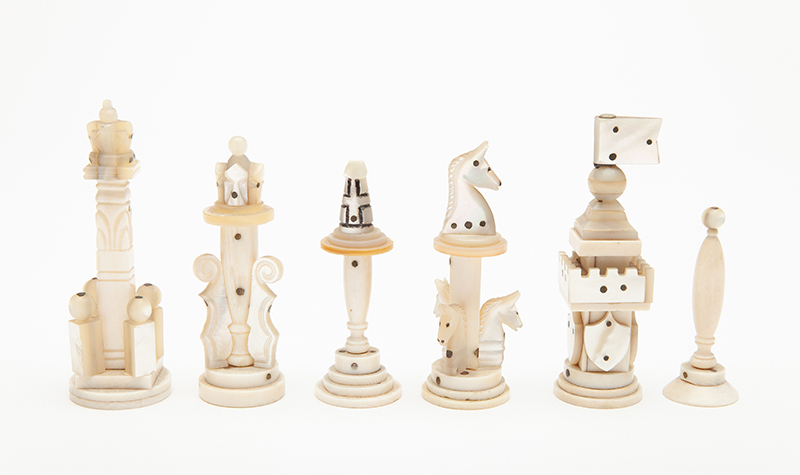 Created from mother of pearl and ivory, this elegant chess set features playful variations of familiar pieces. The set once belonged to Jacqueline and Gregor Piatigorsky, a couple who shared a passion for music, art, and chess. A skilled chess player, Jacqueline earned second place in the 1965 U.S. Women’s Chess Championship. However, she earned greatest acclaim for her philanthropic chess activities as well as her sponsorship of the Piatigorsky Cup—one of the strongest tournaments held on American soil before the Sinquefield Cup, which is held annually in Saint Louis. Gregor was one of the most famous cellists of his era, and during his travels, he collected beautiful artistic chess sets that he displayed at the Piatigorskys’ Los Angeles, California, home. 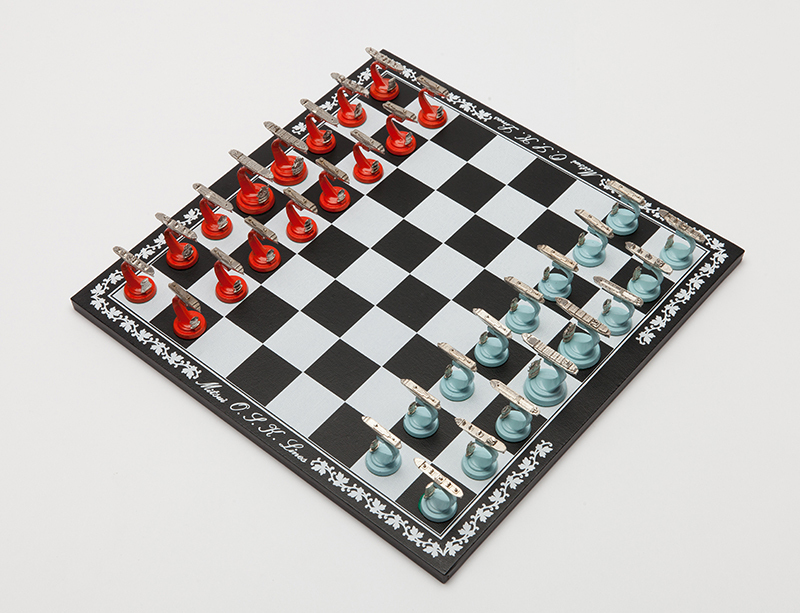 March’s Featured Chess Set is from the collection of the World Chess Hall of Fame. Since its creation in 1986, the World Chess Hall of Fame (WCHOF) has endeavored to highlight the history and cultural significance of the game of chess. 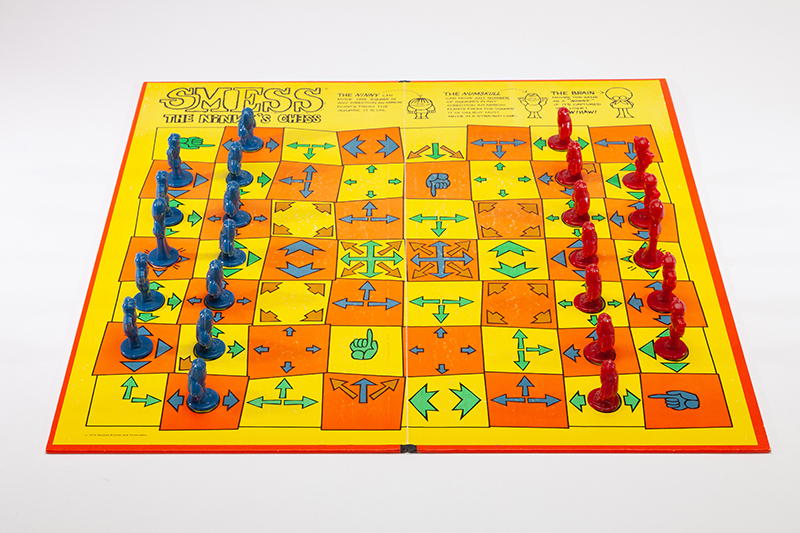 The WCHOF’s collection is diverse and includes sets once owned by legendary players, mass-produced sets with lively pop culture themes, antique ivory sets, travel sets, as well as chess computers. Through these artifacts, the WCHOF illustrates how chess has evolved through its over 1500-year history. King size: 1 1⁄2 in. Board: 5⁄16 x 11 13⁄16 x 11 13⁄16 in. Sleek silver ships sail atop stands that resemble waves in this promotional chess set from the collection of the World Chess Hall of Fame. Headquartered in Tokyo, Japan, Mitsui O.S.K. Lines is a Japanese transportation company. The company was formed through the merger of OSK Lines and Mitsui Steamship Co. in 1964. The pieces resemble their different types of cargo liners and each have a small representation of their piece on their base to aid players in differentiating the pieces. 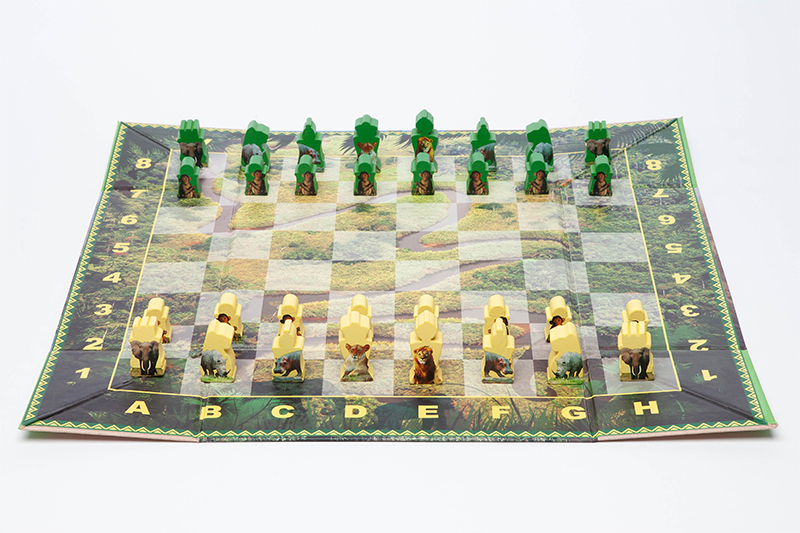 April’s Featured Chess Set is from the collection of the World Chess Hall of Fame. Since its creation in 1986, the World Chess Hall of Fame (WCHOF) has endeavored to highlight the history and cultural significance of the game of chess. The WCHOF’s collection is diverse and includes sets once owned by legendary players, mass-produced sets with lively pop culture themes, antique ivory sets, travel sets, as well as chess computers. Through these artifacts, the WCHOF illustrates how chess has evolved through its over 1500-year history. Check back next month for another featured chess set!